I frequently have students ask me about sixteenth notes. How do they work? How do I count them? What do they look like? And more. In this post, I’ve uploaded a beginner’s guide to sixteenth note figures that I often use with students. It explains, in a very simple and graphic way, how sixteenth note figures work. The worksheet I’ve included here is not exhaustive. It doesn’t cover every single permutation of sixteenth notes. However, it does cover the figures that beginners see most often. The less common figures will be covered in Part 2. Let me explain the worksheet, top to bottom. The top three measures simply show the relationship of quarter notes (the first measure across the top) to eighth notes (the second measure below the quarter note measure) to sixteenth notes (the third measure). The text above each measure indicates the counting mnemonic that should be used. For quarter notes, simply say the number of the beat for each note (“One” “Two” “Three” “Four”). For eighth notes, each additional note (now there are eight instead of four) has the mnemonic “And.” This is often written as a plus sign (“+”), but I’ve written out the word “and” because that is the syllable that you actually say when counting. “One-E-And-Ah; Two-E-And-Ah; Three-E-And-Ah; Four-E-And-Ah,” where each syllable is spoken for each successive sixteenth note. It’s a simple system that you need to burn into your memory banks. The counting will guide you so that you know where you are in the time and it will help you play more difficult rhythms. You’ll also have to memorize what the symbols themselves look like. That’s easy enough. 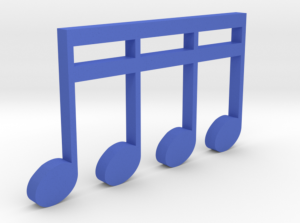 Just look at them and remember that quarter notes have a single stem attached to the filled in elliptical note head, while eighth notes add a horizontal flag across the top to make the quarter note into an eighth. The sixteenths have a second horizontal flag across the top. The next set of two measures shows you how the sixteenth note grid lines up with a single sixteenth note in any of the four possible positions (ie. the number, the “e,” the “and” or the “a”) in the group of four. The graphic and dotted lines should help you understand where each note is placed and how it is counted. Finally, the last two measures explain four of the more common sixteenth note figures. These are the figures that include three of the four notes in a group of four sixteenths. There are four possibilities here and each of them is notated in each successive position on the final measure of this worksheet. I’ve found that beginners often find it helpful to think of these rhythms in terms of what is “subtracted” from the group of four sixteenths. For example, the first figure on the left of the last measure is a group of four sixteenths with the “a” sliced off. The next figure has the “and” missing, while the third figure has the “e” missing and the last figure on the right has the numbered note missing. Counting mnemonics are included as well. I’m going to make a video for this post soon, but for now, I think that this worksheet should be helpful. Let me know what you think: feel free to ask any questions in the comments section.